Do you know someone that you think is worthy to be considered for this high-profile team? 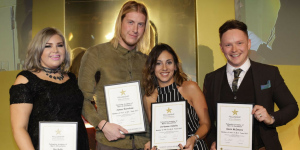 Who has the hairdressing and presentation skills, original talent, experience, team focus, charisma and sheer “star quality” to benefit from this wonderful year of exposure to all that’s best in our industry? In April each year, the Fellowship of British Hairdressing begin their search for the years aheads F.A.M.E. Team, by welcoming nominations from our Fellowship members. They’re simply looking for the brightest young talent around. The individuals nominated must be linked to a Fellowship member salon for the whole year of their time with the F.A.M.E. Team. Once nominated, individuals will be sent an application pack, requesting them to submit photographic imagery of their work as well as a CV and information about why they think they should be a member of the Team. The applications are then judged by a panel of Fellowship members, and the successful applicants to go through will be invited to attend the semi-final competition. The final stage of the competition is on The Fellowship stage at Salon International each year, before the lucky final four are announced at the Fellowship Luncheon in December. They will be launching their search for the F.A.M.E. Team 2018 on Monday 3rd April 2017, nomination forms will be available on their website and distributed to all members.